University of Virginia astrophysicist Rukmani Vijayaraghavan shared her research on far-flung galaxies. Darden School of Business professor Lalin Anik offered a glimpse into the business world, while volunteers from UVA’s iLab told stories of entrepreneurship. UVA engineering students discussed what they are learning in class and in the lab, and volunteers from the School of Medicine talked about the future of health care. 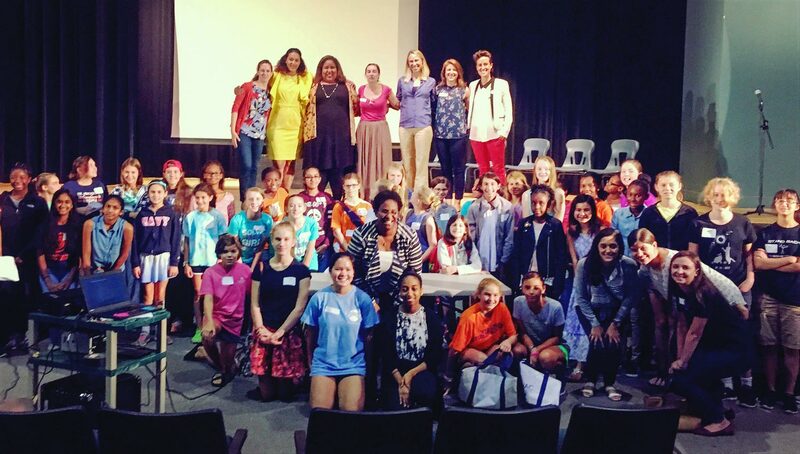 All of them were there to meet the more than 150 girls and their parents who gathered Saturday at Albemarle High School for Charlottesville’s first ESTEAM Conference for Girls. The conference, sponsored in part by Darden’s Batten Institute for Entrepreneurship and Innovation, connected girls from kindergarten through 12th grade with dozens of local women who are leaders in entrepreneurship, science, technology, engineering, art and math, abbreviated as ESTEAM. The event, which was free for all attendees, was inspired by a nationwide campaign around the documentary “She Started It,” which profiles women entrepreneurs starting business in the tech world. Participants came from 50 different schools in Charlottesville and the surrounding counties, joining some students who are home-schooled. “I have seen firsthand the impact of students connecting with someone in a career field that they are interested in,” said Albemarle High gifted resource teacher Alexis Mason, one of the conference organizers and the founder of Ed Power Educational Consulting. Mason cited studies showing that fifth- and sixth-grade girls – even those who have shown a deep interest in science, math or technology – do not continue with those passions as frequently as boys do. To help combat that drop in Charlottesville, she organized Saturday’s event with Kim Wilkens, a computer science coordinator at St. Anne’s-Belfield School, founder of local non-profit Tech-Girls and a board member of Charlottesville Women in Tech; Western Albemarle High School gifted resource teacher Zoe Padrón, founder of the college coaching group All Paths Are Good Consulting; Joyce Ivory, the recruiting manager at the UVA-based National Radio Astronomy Observatory; and Heather Arquitt, the Women’s STEM Forum organizer at the local research firm, Battelle. All of the organizers hope Saturday’s event will help girls picture a future for themselves in science, technology and business. The organizers were also committed to making the event free to all families in Charlottesville, with the support of sponsors from the University and the community. Anik, the Darden professor, said she was excited to talk with so many students and meet other female leaders in Charlottesville. Saturday’s sessions – split by age – were as varied as the presenters themselves. Anik and other volunteers, including volunteers from the UVA Medical Center, the School of Engineering and Applied Sciences, the Department of Astronomy and Darden, met with students in small networking sessions and sat with them at lunch to talk about what they do. There was a career scavenger hunt, introducing girls to women with all sorts of different careers, and multiple demonstrations. Kitty Ashi, who owns the downtown Charlottesville restaurants Monsoon Siam and Urban Bowl, even made nitrogen ice cream in a cooking demonstration. Attendees and mentors also watched the “She Started It” documentary, featuring women entrepreneurs from around the world. “The girls could go from station to station, just getting to know these remarkable women in our community,” Anik said. Wilkens pointed out that the event also provided a chance for female leaders in Charlottesville to get to know each other.